Place the meat on plates. Heat the oil in a fondue pot on the stove to 175°C then place on the hot burner. Important: The oil must never be smoking hot. Place the pieces of meat on a skewer, fry in the oil and eat with sauces of your choice. Due to the high heat, to make a fondue bourgignonne you need an enamelled steel or stainless steel pan, which narrows a little towards the top. A metal ring can be placed on top to protect against spitting, hot oil. 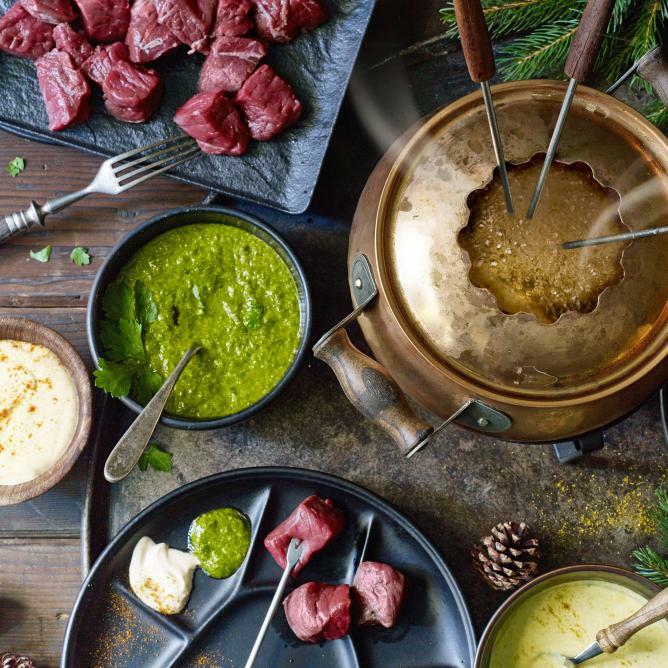 Never leave the fondue pot with the hot oil unattended, as hot oil can cause very serious and painful burns.